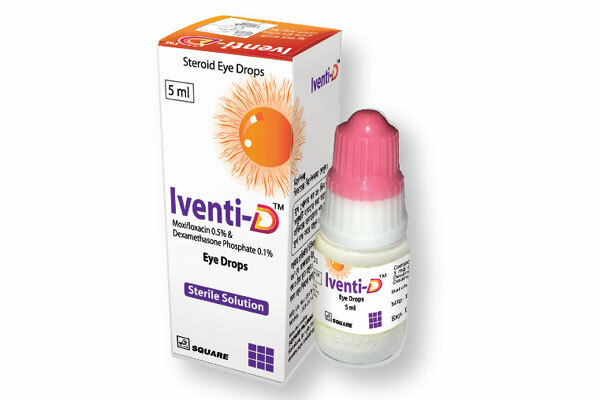 Iventi-D Eye Drops is indicated for steroid-responsive inflammatory ocular conditions for which a corticosteroid is indicated and where bacterial infection or a risk of bacterial ocular infection exists. The combination can also be used for post-operative inflammation and any other ocular inflammation associated with infection. Prevention of post-operative ocular Inflammation and Infection: Instill 1 drop, 4 times/day in the eye to be operated, starting 1 day before the surgery and during 15 days after the surgery. Treatment of ocular Infections caused by susceptible organisms: Instill 1 drop 4 times/day during 7 days, or as directed by the doctor. Each LDPE container contains 5 ml of Moxifloxacin 0.5% and Dexamethasone Phosphate 0.1% of sterile solution.